Everything works together so beautifully-the chicken-the egg-the salad-the mayonnaise. This is very easy to make, a great midweek dinner as it really is so easy, while the chicken is baking, you just prepare the other things. If you don't want to make your own mayonnaise, just add some lemon juice and salt to store bought mayonnaise (I like Thomy mayonnaise myself) and it will make it taste better and kind of homemade. If you try and make this mayonnaise and it looks as if it splits or curdles, the addition of a little boiling water can bring it together. I have added celery into the recipe (as it is in the original recipe) but I really don't like raw celery so I don't actually put it in when I make this. ​A great midweek meal, tastes so good, with very little effort. Line an oven tray with some baking paper. Season the chicken pieces on both sides with some salt and pepper, to taste. Place the chicken pieces, skin side up on your oven tray. Squeeze the lemon juice over the top of the chicken. Roast for 40-50 minutes, or until the skin is crisp and golden. Approximately 10 minutes before the chicken should be ready, toss the bread with the oil in a bowl, season with salt and pepper, and scatter over and around the chicken in the baking tray, continue roasting for 10 minutes. Meanwhile, bring a small saucepan of water to a simmer over high heat. Add the eggs, reduce the heat and simmer for 5-6 minutes. Drain and plunge in cold water. Peel the eggs, but don't slice until serving, so that the egg yolk runs onto your salad, it adds to the dressing. Chive Mayonnaise: Use a blender to blend the egg yolks, a pinch of salt and the lemon juice, until well combined. With the motor running, slowly add the oil, 1 tablespoon at a time, until the mixture is thick and creamy. Stir through the chives just before serving. 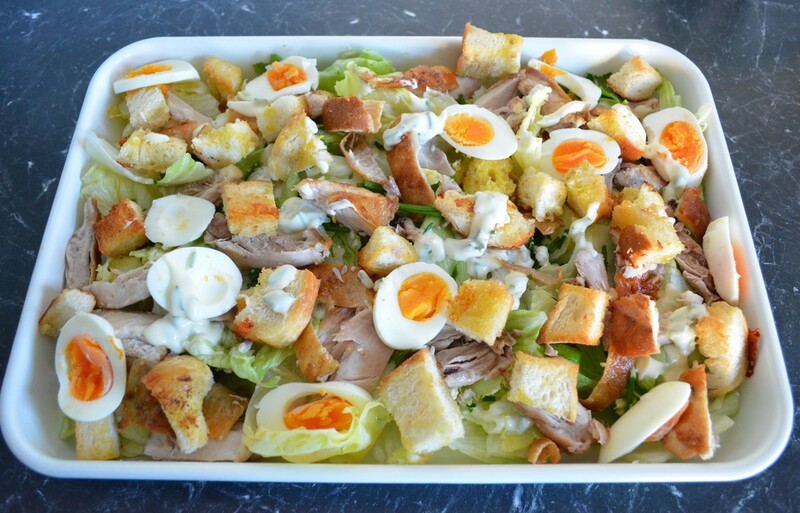 Once your chicken and croutons are ready, remove from the oven. Remove the bread and set aside, allow the chicken to rest in a warm place for 5 minutes. In a large bowl, place the lettuce, celery leaves and batons (if using). Add the bread and chicken and gently toss it all together. 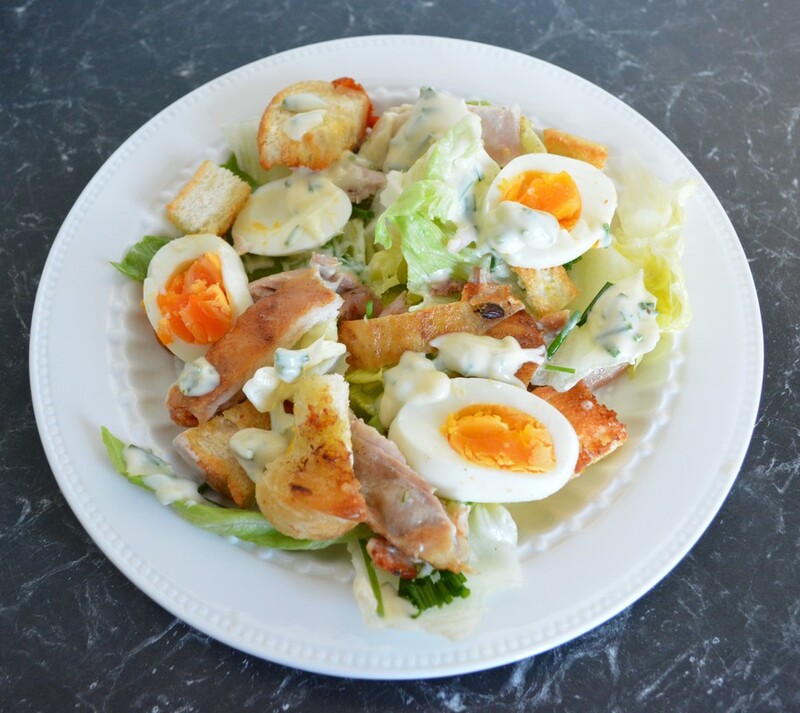 Divide between serving bowls, slice the eggs onto the salad, with the chive mayonnaise. Sprinkle with the chopped chives.